I've always been a fan of pastrami and I really enjoy making my own. The process takes a while but the actual work required is very small. Making your own also allows you to tweak the spices however you want, resulting in a bunch of fun directions you can take the pastrami. When cooking pastrami, or any cured brisket like corned beef, the time and temperature combinations you can use are widely varied. For this pastrami I really like 145°F (62.8°C) for 36 to 48 hours, it creates the more traditional texture of pastrami while still being nice and moist. For a really moist pastrami you can do 135°F (57.2°C) for 2 to 3 days, or for a more traditional texture I recommend 156°F (68.9°) for 12 to 24 hours. If you would like more information about the modernist techniques, ingredients, and equipment used in the sous vide thick cut pastrami reubens recipe you can check out the following. To make the brine combine all the brine ingredients into a pot and bring to a boil. Reduce to a simmer for 5 minutes then remove from the heat and cool. Place the brisket in a non-reactive container large enough to hold it. Cover with the cooled brine. Place in the refrigerator for 2 to 3 days, making sure the meat stays submerged the entire time. Take your brisket out of the brine and smoke it. 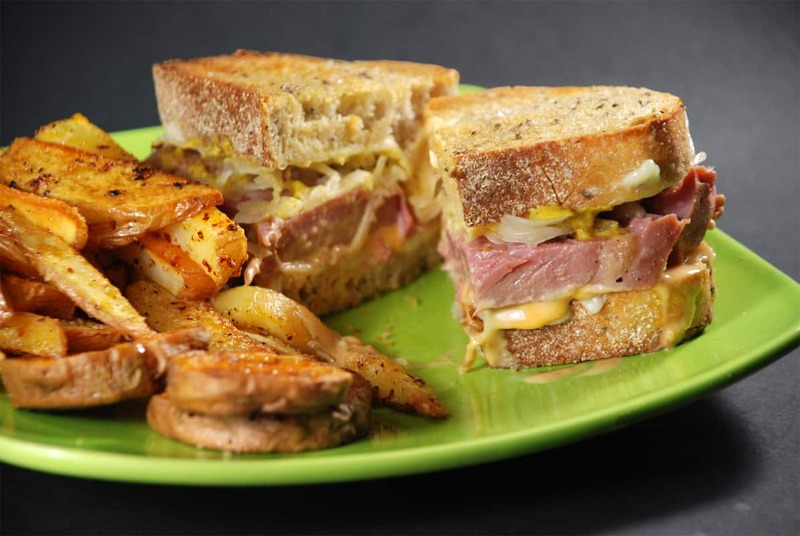 There are three normal methods for adding smoke to the pastrami, use whichever method you prefer. 1) Use a smoker or grill with wood chips to smoke the meat for a few hours before sous viding. 2) Grill the short rib meat quickly over on a hot grill to capture some smoke and charcoal flavor. 3) When sealing the meat in the sous vide bag add Liquid Smoke to it. Once you have added the smoke to your short rib meat preheat your sous vide water bath to 137°F. Seal the meat in a sous vide bag and place the bag into your water bath. Let it cook for 36 to 48 hours. Remove the pastrami from the sous vide bag and slice thinly. Brush one side of the bread slices with olive oil and toast them until browned. Place the cheese on the un-toasted side of the bread and toast in an oven or toaster oven with the broiler on until the cheese melts. Add the thousand island dressing to half of the slices and the mustard to the other half. 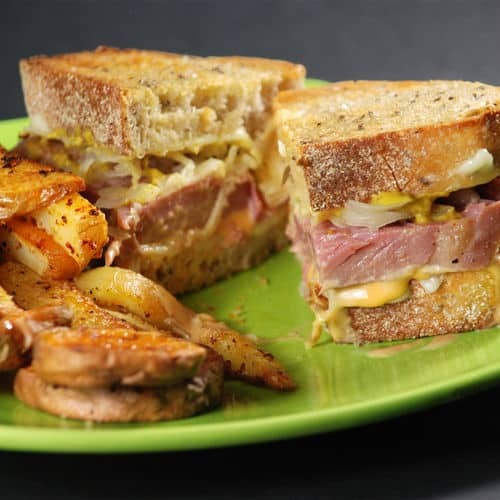 Pile the pastrami on the slices with the mustard and top with the sauerkraut. Place the two halves together and serve. I enjoy making my own pastrami; the process takes a while but the actual work required is very small. Making your own allows you to enjoy a variety of options as you tweak the spices!